Commemorative years for composers are no longer news, yet in the case of Franz Liszt (1811-1886) the extra attention coming from concerts and broadcasts worldwide, CDs and downloads seems especially welcome. After all, man and music remain generally little appreciated, even less understood. The tags of empty virtuosic display or romantic wish-wash are still branded on the majority of Liszt's output and his reputation as pianistic showman continues to overshadow his groundbreaking achievements in the 19th century music field. 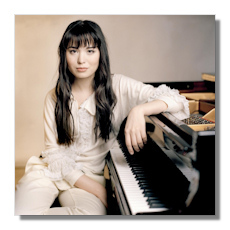 That a young artist like Alice Sara Ott tells us a different story, placing Liszt in an altogether more propitious light, is therefore all the more remarkable. 22-year old Alice Sara Ott is of German-Japanese parents and studied with the reputed Mozarteum pedagogue Karl-Heinz Kämmerling. With her first two CDs (featuring the Grandes Etudes de Paganini and in her first disc for the famous yellow label the Etudes d'exécution transcendante – Deutsche Grammophon 477836-2) she demonstrated a natural affinity with the music of Liszt, getting really under the skin of even the most note-saturated passages with a sure sense of their significance. When I heard her in a concert in the Kölner Philharmonie, playing Liszt's 1st Piano concerto and Totentanz with the Vienna Symphony under Adam Fischer, I was even more convinced by her approach. Undeniably a thoughtful artist, tempering youthful fire with a sense of control, Ott invested the concerto with an agreeable Apollonian harmony. The virile, heroic statements came aptly balanced by tender lyricism and a cantilena quality that reminded us what a superb melodist Liszt was. In the mere 20 minutes of the concerto she uncovered a variety of moods, drawing by the clarity of her articulation our attention especially to the range of colors in Liszt's palette. The opening of the quasi adagio had an almost nocturnal quality in her hands, flowing dreamlike in a finely judged tempo. She can conjure up astounding power and speed when required, always firmly grounded on a strong left hand, yet in the end the hushed moments linger on as much as the martellato passagework. All the more so in the Totentanz, which can easily become in the wrong hands a bashing contest. Here, too, she exploited the different moods with intelligence, without losing grip of the whole picture. She was almost caressing the keys in the lento 4th variation, before gradually building up towards the exhilarating vivace. She kicked up a storm but there was never a moment that felt rushed, a note skipped, or a gesture out of control. And it has to be said she has a ravishing piano sound which even in the most demanding passages never becomes clangorous. Arguably this is not obvious music, but Alice Sara Ott gave ample proof it is profound music. Alice Sara Ott is an attractively communicative performer (often playing, as she did here, barefooted) and throughout there was a genuine pleasure at music-making together with the orchestra. Adam Fischer and the Vienna Symphony were on the same wavelength and orchestral solos beautifully blended with the piano part, emphasizing Liszt's ever-inventive orchestration. She finally enchanted an already enraptured audience with a knockout performance of La Campanella, the third and most famous of the Grandes Etudes de Paganini. Allying phenomenal technical precision with a compelling sense of phrasing and dynamic shaping, she had the audience cheering and up on its feet. The concert concluded after the interval with a rather indifferently played Brahms 1st Symphony. What the Vienna Symphony seems to lack is a distinctive stamp. Unlike their more famous colleagues of the Philharmoniker the woodwinds aren't particularly memorable and the strings, in spite of being antiphonally placed here, produced a rather thick sound which is better avoided in Brahms. The transparency achieved in some of the preceding Liszt was absent, although Fischer's mechanical conducting was partly to blame for the feeling of disappointment. The opening wasn't carrying much promise or suspense and things never really took flight with the exposition either. In a way, it felt as a relief there was no exposition repeat, because when performed as uneventful as here, this Brahms can feel like a very long listen. Fischer's handling of the dynamics, with abrupt forte's, sounded affected. Textures opened up in the adagio sostenuto, although it was only with the last movement the sun really began to shine and Fischer guided the well prepared finale to a grand and worthy climax. The audience was sent happily home with two merry encores, a Hungarian dance from Brahms and a polka from Johann Strauss. Yet it was by all means Alice Sara Ott, and Liszt, who lingered in anyone's memory.